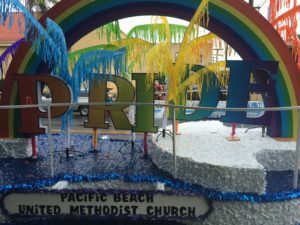 On July 16, PB UMC will again be participating in the San Diego Pride Parade. Louis P. will be coordinating the decorations for our float. Some of PB UMC’s previous entries have won awards! Our float designs are always interesting, informative, and a lot of fun! The parade begins at 11:00 am at the Hillcrest Pride Flag at University Ave and Normal St, proceeds west on University, then turns south on 6th Ave, turns left onto Balboa Dr, and ends at Laurel St. For a map and link to directions, click the button below. To volunteer to help build the float, please contact Louis P. through the church office. 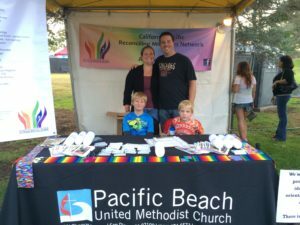 Also, PB UMC will again host a booth at the Pride Music Festival, which will run Saturday and Sunday, July 16 & 17 (11:00 am to10:00 pm on Saturday; 11:00 am to 8:00 pm on Sunday), in Balboa Park. The Music Festival includes multiple stages of entertainment, more than 200 musicians, bands, comedians, and dancers, as well as marvelous shopping at dozens of vendor booths, an art exhibit, cultural presentations, and great food. It’s truly a weekend of full-scale family-friendly entertainment! Sidney Y. is coordinating our booth volunteers. We will distribute PB UMC merchandise at the booth. Last year, merchandise included pens, refrigerator magnets, sticky notes, and PB UMC logo bottles. The main purpose is to introduce members of the public to PB UMC and our Reconciling Ministries. To sign up for a time slot in our booth, click the button below. For more information about the Music Festival, click here!